Spend some fun summer time reading some of these books with your kids. According to many studies, kids who do not continue their learning over the summer lose much of the knowledge they gained in the previous school year. By having your children read throughout the summer, it will help them to retain information and continue to learn. 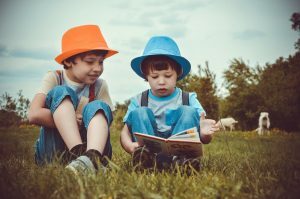 While you spend your time reading with your kids, a Winston Salem, NC house cleaning service like The Maids can take care of your home, so that you have more time to get your child excited about reading. Read About Friendship for Grades 1-3. During summer break, your kids won’t get to see their friends every day, but they can still read and learn about what makes and grows a friendship. A great book to start with this summer would be The Cookie Fiasco by Mo Willem. Part of the Elephant and Piggie Like Reading series, The Cookie Fiasco will teach your child about the kindness of sharing, and throw in a little math lesson, when four friends try to solve the problem of dividing up 3 cookies among themselves. Summer Adventures for Kids 10-12. When your child isn’t seeking out his or her own adventure, he or she can read about one in Escape from Mr. Lemoncello’s Library, book one in the Mr. Lemoncello’s Library series by Chris Gabenstein. This book contains puzzle solving in order for Kyle and his friends to escape the locked library. With twists and quirky characters, your child’s imagination will be running wild and wanting book two before school is back in session. Realistic Reading List for Grades 3 and Up. Wonder is a book about a young boy with a facial difference. This New York Time’s bestseller portrays the struggles with empathy and compassion as August starts 5th grade and goes to a school for the first time in his life. Your child will learn acceptance and have the opportunity to understand that just because people do not look the same, does not mean that they should be treated any differently. Scholastic Reading Challenge for Summer. Another cool option to look into is the Scholastic Reading Challenge for the summer. It is free and available to grades preK-12. As they read, your kids can log their reading minutes and win digital rewards. There are even themed reading challenges, such as the Harry Potter series, that include games and quizzes. All you have to do is go to their website to get started. Does your child have friends interested in reading too? Mention the challenge to their teacher and the whole class can get involved. Your time is precious and spending it with your children, not worrying over housecleaning, is invaluable. The Maids can free up some of your time with Winston Salem house cleaning services. Customized cleaning plans can be created to fit your lifestyle and schedule. Call today at (336) 292-7805 to set up a free in-home consultation.